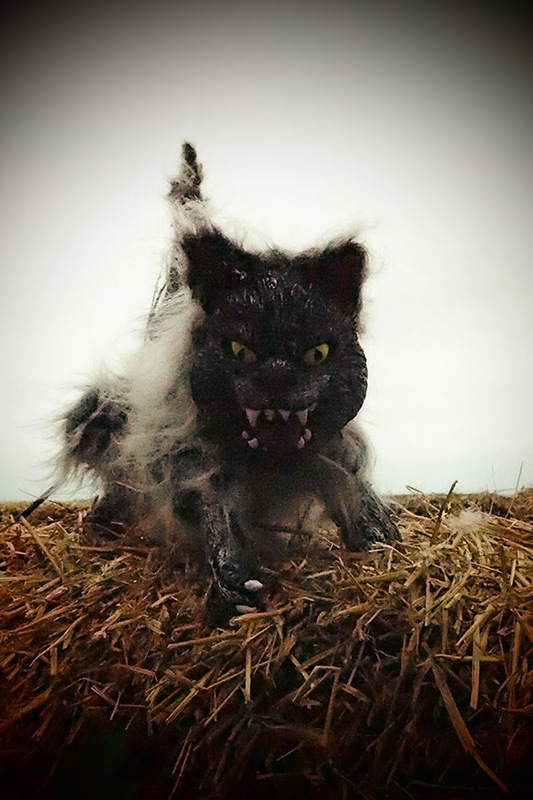 When it comes to Halloween, Koksijde en St. Idesbald are some of the best places to visit in Belgium. 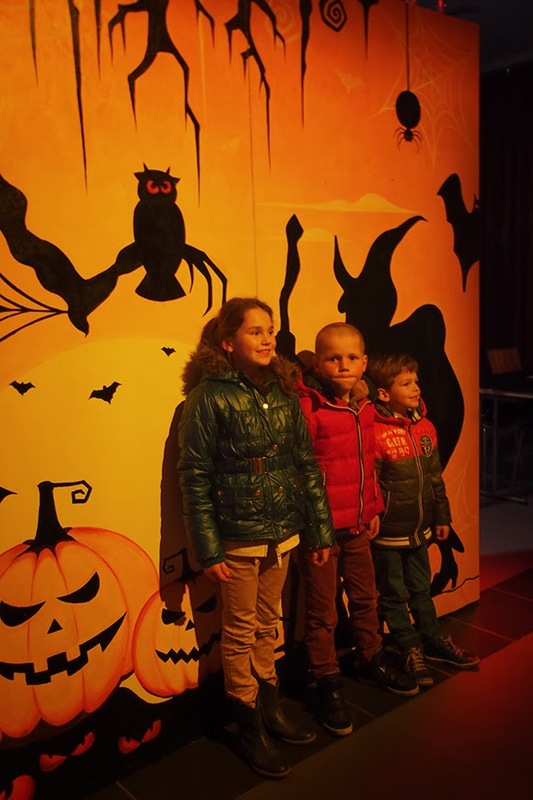 Usually we don't celebrate Halloween in Belgium, but these coastal towns do their utmost to organize Halloween activities such as a Halloween parade, ghost trail, live music, free pumpkin soup, pumpkin carving contest, haunted house and Halloween 3D World. This past Thursday, a representative of the municipality of Koksijde guided me through all their Halloween events. Here's a little overview of the day. The first place I went was called Thriller, a three-storey haunted attraction for kids. It's your typical roller coaster ride through a maze of fog, darkness, spooky puppets, ghostly wind, sound effects, and finally a crazy man chasing out through the exit. Halloween 3D World was next, a hall with nine creepy decors to photograph the kids. Most of the decors have holes through which the children can stick their heads. After Thriller and Halloween 3D World, we went to the beach promenade of St. Idesbald, where dozens of children participated in the local pumpkin carving contest. 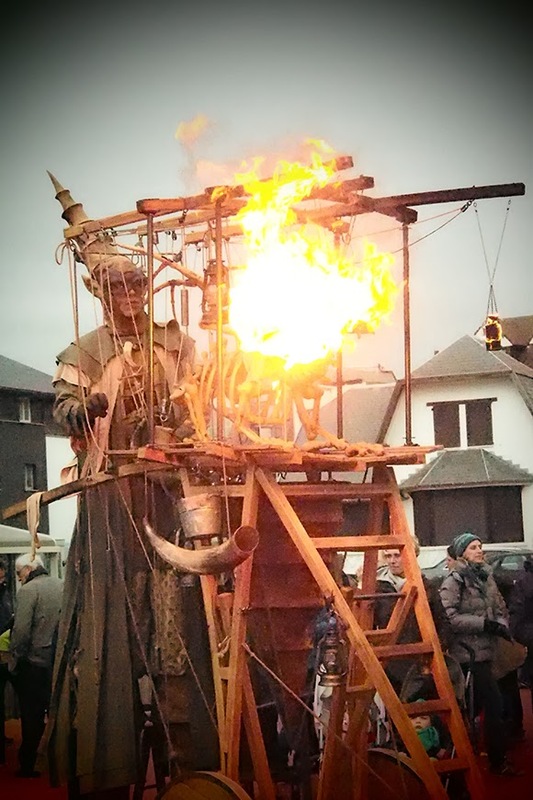 After an excellent waffle snack in 't Zwart Schaap and a look at the local Halloween decorations, it was time for the festivities to really kick off with street theater and live music. As the dark grew closer, the air filled with the scent of fresh pumpkins as a stall distributed free pumpkin soup to all the passers-by. Children collected their prizes for best-carved pumpkins and most original costumes. 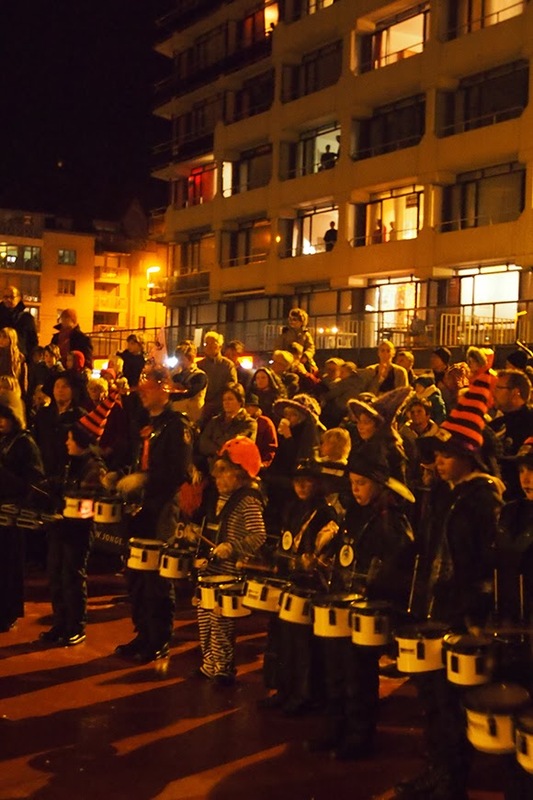 Around seven, the evening sky lit up with the colors of autumn as the Halloween parade concluded the festivities. 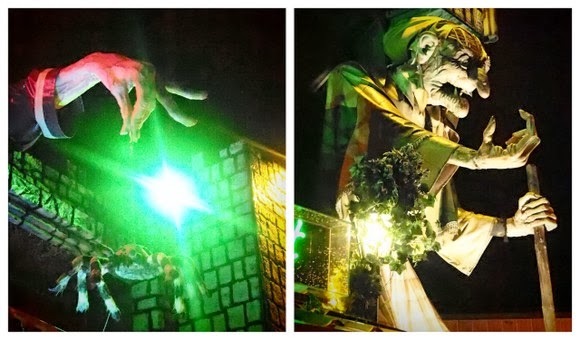 Among the parade's signature features were monsters, giants, ghosts, goblins, witches, werewolves and vampires. Seeing those creepy creatures against a beach backdrop definitely added to the atmosphere. 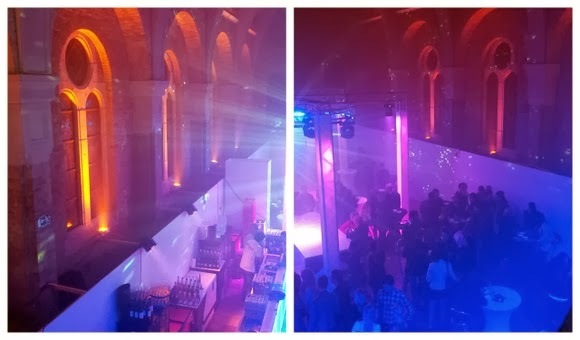 After the Halloween parade, we went to Glam Events' Halloween party, held in a church and complete with unlimited champagne and tasty snacks. The best part of the day, however, came at the end: a ghost trail through the dunes and woods of St. Idesbald with moonlight as the only guide. Spooky ghouls and goblins startled those who dared to venture into the dark. Stalls with free pumpkin soup and drinks marked little pauses now and then. Many thanks to the municipality of Koksijde for the opportunity and good care. All this looks like so much fun. I love the reddish pumpkins! Wow! That looks like a lot of fun. Great pictures. Hope you have a fantastic week ahead. Wow, great pictures. Sounds like quite the Halloween experience. The kids act like expert carvers of pumpkins. Looks like good times! We did a family Halloween booth where kids toss a ping pong ball that looked like a bloody eye into a table full of gold fish bowls. Their prize: a gold fish, not candy. Sounds like quite an event! Thanks so much for commenting on Ruth's blog tour post. It's great to meet you! Wow, I'm exhausted! That's way too much fun all at once for this asthmatic. Although you could have parked me at the church with the unlimited champagne for a nice long rest ;-) I've never seen red pumpkins before -those are way cool! Thanks for sharing such a fun occasion with us. I love reading about other cultures and how they celebrate! Bijzonder leuk en erg mooi in beeld gebracht.....prima gedaan. Amazing photos! The decorations have a different look than the U.S. Interesting too! And I thought nobody celebrates Halloween in Belgium anymore, as there was nothing in Waterloo and very few and unofficial celebrations in Brussels. Last year I had bought sweets and nobody came ! I didn't know people in Belgium celebrate Halloween like people in USA. Here in my part of central Europe we have All Saints day that day when people go to take flowers to the graves of their loved ones, but it is not a commercial holiday. This all looks like a lot of fun. I wish more was done to celebrate Hallowe'en here in the UK. Wat een prachtige rondleiding heb je gehad om Halloween te beleven. Ik ben er totaal niet mee opgegroeid. Leuk dat je op mijn blog kwam, ik wil even teruggroeten! Ik wist zelfs niet dat er Halloween activiteiten in België waren. Goed om te weten. Oh wow! I want to come visit you for Halloween next year. Wow, they really "do" Halloween right! Great photos. Ooo wat leuk dat je mij een bezoekje bracht Vanessa, zo kon ik ook jouw blog ontdekken en wat voor een blog, ik ben blij dat ik het allemaal mocht zien, want jij bent precies even goed in de fotografie als in het schrijven! dank je voor je lieve commentaar op m'n blog. Ik ga hier ook eens rondneuzen, maar het ziet er nu al uitnodigend uit. Great pics! I love Halloween, but more for the pumpkins than anything :) Or the decorations and stuff, but not necessarily the scary side of it. Americans are obsessed with getting scared, and thrillers and stuff, and I hate it! I'm such a chicken. Awesome photos, Vanessa. It's what I miss most about living so far from the city. We miss all the celebrations. Alhoewel ik er absoluut niet van hou, 'het halloween feest' , zie ik wel mooie dingen de revue passeren. Merci voor uw bezoek aan mijn blog, zo leer ook ik andere blogs kennen. This is wonderful. I usually stay home on Halloween, but I'd love to visit a place like this. Wonderful photos, I also like fantasy films, interesting festival! Wow what a fun and scary halloween! Nice photos. Thanks for sharing. Even thought I am carving pumpkins every year, I have actually never tried pumpkin soup. Thanks for linking up to #Halloweenlinky Week 3 is live now.